Given the timecontrol some upsets were to be expected. Lenka Ptacnikova managed to beat the super GM Bu Xiangzhi and Mikael Johann Karlsson managed an upset vs Wang Yiye. For the Chinese, the young super GM Yu Yangyi showed great fighting spirit and quality and finished with a very impressive 11,5 out of 12. For the Icelanders the top scorer vs GM Hjörvar Grétarsson with 5,5 out of 12. 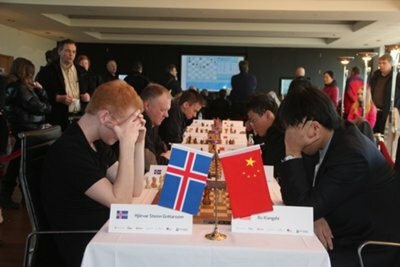 The match was held to commemorate the 60 year anniversary of the Chinese-Icelandic Cultural Society which in conjunction with the Icelandic Chess Federation organised the event with the sponsorship og Arion Bank, CCP, Promens, Icelandic and Elkem.